Calling all backyard farmers, gardeners, and growers! The Community Trading Table is a unique Grey Lynn Farmers Market initiative. Any local person with a backyard surplus of vegetables, fruit, flowers, or eggs can come to the trading table and sell their produce. Please note: due to Fruit Fly restrictions all fruit, as well as tomato, cucumber, capsicum, avocado, eggplant, olives, and walnuts and macadamias cannot currently be sold on the trading table. Restrictions are set to last until November 2015. The table is revival of the farm gate honesty-box system that used to be so prevalent in New Zealand landscapes. It’s also about creating a local neighbourhood food economy. To use the table, bring down your produce, clearly labelled and with your own honesty box (such as a jar or plastic container). Make it as obvious as possible for the buyer as to where they should put their money – some sellers keep all their things in a basket or box. For Friends of the Market, this table is free to use! Otherwise, it costs just $3 per market. Please make payments to the market manager at the information table. 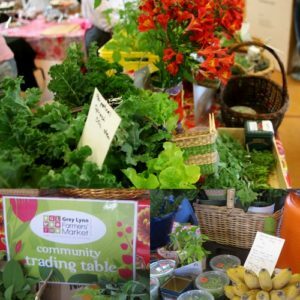 The trading table is a great deal for both local growers and local consumers and has a unique mix of seasonal produce at any given market. From mustard greens to bananas to exotic herbs like epazote, you never know what you might find!